Last Friday I hosted a sketch challenge over at Paper Craft Planet. There is still plenty of time to play along! Click on over to see what's going on at the Planet!! I had the most fun making this card. I had NO idea what I was going to do, but I had this great little My Mind's Eye Tangerine paper pad in front of me and I knew I wanted to do something with a chevron pattern. I used my Martha Stewart folding ruler to make the chevron cuts and then adhered them to a piece of red card stock. 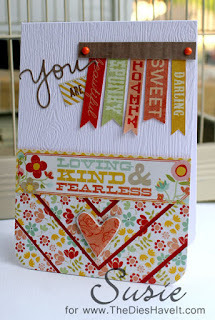 Then I just grabbed borders and sayings from the mini pad of paper and finished up my card base. Even the heart is cut from patterned paper in the pad and then covered with Glossy Accents. Oh - and by the way, the card base is made from some faux woodgrain paper available here. The YOU diecut is also cut from an exclusive die found right here. I love the way this card turned out. Sometimes, even without a plan, it all just comes together!! Stunning. Love everything about it.